Ousted Yaroslavl mayor to remain in detention | Russian Legal Information Agency (RAPSI). MOSCOW, August 30 (RAPSI) - The Basmanny District Court has extended until December 3 the detention of ousted Yaroslavl Mayor Yevgeny Urlashov accused of taking bribes, RAPSI reports from the courtroom on Friday. Judge Natalya Mushnikova has thus granted the investigators' motion and rejected the lawyers' application for house arrest or release on bail. According to investigators, Urlashov, who was elected to the mayoral post in April 2012, together with three of his staff extorted a bribe of 45 million rubles [$1.4 million] from the director of a company who had been contracted by the central Russian city for cleaning services. The police detained Urlashov on July 3. He denied the accusations against him, dismissing the charges as "political games." The Interior Ministry called for the case not to be politicized and insists it is the result of a routine criminal investigation. 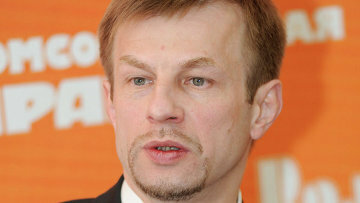 Urlashov, a member of the ruling United Russia party in 2008-2011, who later became a candidate for the opposition, achieved a landslide victory in the city's April 2012 mayoral elections over a United Russia candidate. A member of billionaire-turned-politician Mikhail Prokhorovs Civic Platform party, he planned to head the partys list at the September 8, 2013 elections to the Yaroslavl regional parliament. On July 18, Urlashov was removed from his mayoral post. 16:35 30/08/2013 The Basmanny District Court has extended until December 3 the detention of ousted Yaroslavl Mayor Yevgeny Urlashov accused of taking bribes, RAPSI reports from the courtroom on Friday.